Tag line: "A kingdom ruled by evil. A princess enslaved by passion. A warrior driven by justice"
When all is said and done, 1982’s The Sword and the Sorcerer is a bit light on both “The Sword” (which I’m assuming is the one with the 3-pronged blade used by the lead character) and “The Sorcerer” (who only has a handful of scenes, many not as memorable as they should be), but aside from that, it’s not a bad little action / fantasy flick. To win his battle against Good King Richard (Christopher Cary), bad king Cromwell (Richard Lynch) awakens the evil sorcerer Xusia (Richard Moll) from his eternal slumber, promising to give him whatever he desires in return for his help. Xusia keeps his side of the bargain, and as a result Richard’s army is soundly defeated in every skirmish. But because he fears the Sorcerer’s power, Cromwell ambushes his new ally, stabbing Xusia through the chest and, by all accounts, banishing him back to the nether world. Realizing his kingdom is lost, Richard bequeaths his ancestral weapon, a sword with three blades (two of which can be fired at the enemy in battle) to his oldest son Talon (played as a child by James Jarnigan), then sends the boy away In the hopes that he will one day avenge the wrongs done to their family. Several years pass, and Cromwell, aided by his war chancellor Count Macheli (George Maharis), has conquered over half the known world. Yet, despite his dominance, he fears he may soon lose the position he fought so hard to attain. For one, a rebel army led by Prince Mikah (Simon MacCorkindale) and his sister, Princess Alana (Kathleen Beller), has been gaining strength, and is days away from standing against him. On top of that, Cromwell isn’t convinced that he actually killed Xusia, whose power will have only gotten stronger if he survived. With the help of his spies, Cromwell tracks down the rebel headquarters, taking Prince Mikah into custody and forcing Princess Alana to become his new queen. One thing Cromwell didn’t count on, however, is the mysterious warrior (Lee Horsley) who recently rode into town. A veritable one-man army, this warrior, who, as fate would have it is also the owner of a 3-pronged sword, has sworn to rescue Mikah, which would help end Cromwell’s tyrannical reign. But if Xusia does, indeed, return, will the warrior be strong enough to defeat his black magic, or is the kingdom doomed to fall under the sorcerer’s control? When you look at it, the story that The Sword and the Sorcerer tells, that of an oppressive king facing off against the forces of good, is as basic as they come. A little too basic, actually; with its world filled with sorcerers, mystical weapons, and magic, I was expecting The Sword and the Sorcerer to be more imaginative. In fact, the very first scene, when one of the followers of Xusia uses her powers to bring her master back to life, is cool as hell. After this, the film settled down into a run-of-the-mill rebellion tale, which was a bit of a letdown. In addition, the sorcerer Xusia, despite being mentioned in the title, hardly appears in the movie at all (and when he does, he’s not as powerful as we were initially led to believe). Also largely forgotten is the tri-bladed sword of King Richard, though after seeing it in action, I’d say its lack of screen time is a good thing (early on, when young Talon fights Cromwell’s men, he fires the two external blades at them, which fly through the air on a string, wobbling all the way to their mark). Thus far, I’ve concentrated on the negative, which might lead you to believe I didn’t enjoy The Sword and the Sorcerer. Well, the opposite is true; this is an entertaining ‘80s fantasy film, with plenty of exciting battle scenes, a hero you can get behind, and a gorgeous leading lady (Kathleen Beller). On top of that, Richard Lynch is deliciously nasty as Cromwell, and, for an early ‘80s movie, many of the special effects look surprisingly good. 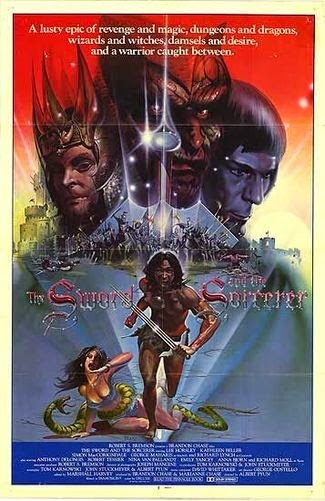 In the end, The Sword and the Sorcerer may lack the imagination of other fantasy films of this era (Clash of the Titans, Conan the Barbarian), but it’s still a lot of fun. Found this on Putlocker but it was a youtube with stupid commentary so wasn't worth watching. I wish I could find it on line to watch. One of the all-time 80s genre classics,for too bad that the long awaited sequel TALES OF AN ANCIENT EMPIRE majorly sucked.